When I'm lucky enough to get to Stitch, I always treat myself to something cheery-uppy. I cannot recommend Jocelyn's shop enough, truly - on that or any other front. I was excited to hear that Malabrigo has just started to produce roving, not least because I'm spinning more lately. I love Malabrigo's colours and how incredibly soft the yarns are, but I'd stopped knitting with them because I don't enjoy the variegation. 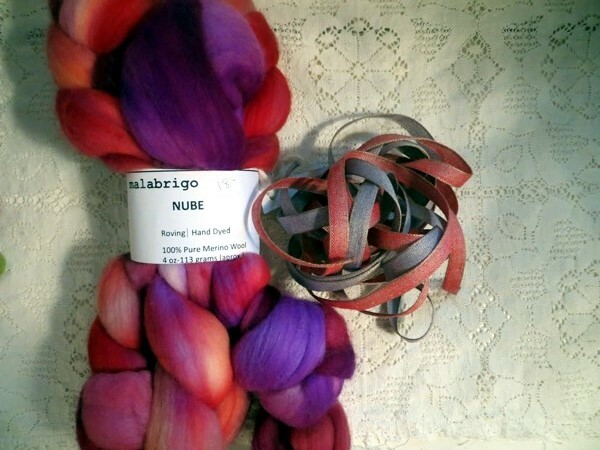 I was even more excited to notice some gorgeous natural fiber woven ribbons on spools in the back room. 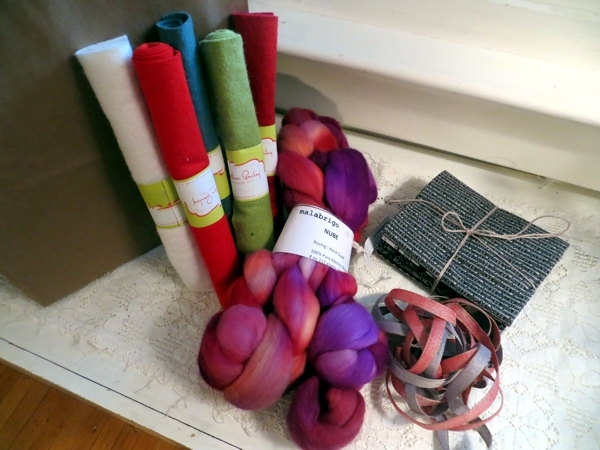 I just didn't notice until I got home that the ribbons and roving I chose, match. As always: I brought home some fabric. 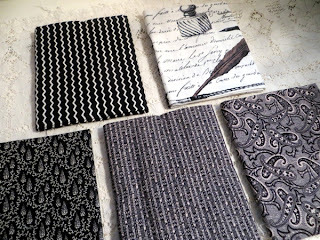 I think I might be using these pieces to learn quilting by way of making new cushion covers for the living room sofa. 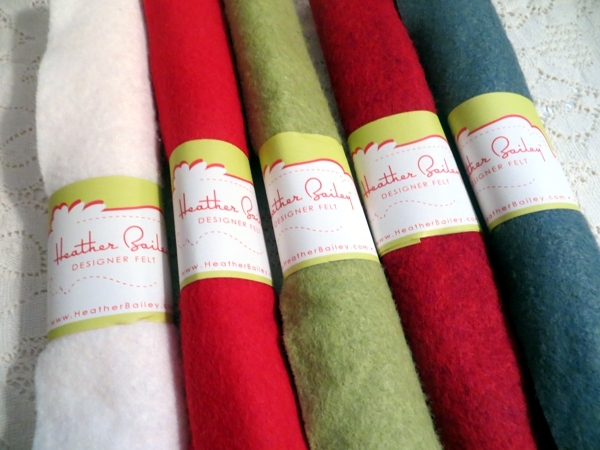 But the unexpected find was this beautiful thin wool-blend felt from Heather Bailey, which I'll use to make homey little ornaments. I really love doing blanket stitch - so soothing - and it will be great to have some new reasons to do it. Since I was at the store last weekend I've already spun and knit the roving, and I'll tell you that story tomorrow. Till then, have a great, crafty day! Your talents truly amaze me! I can barely fit in time to knit in a day much less have time to do the woodworking projects that sit waiting for me in the garage workshop! I've always wanted to learn to quilt, my step-mother was a very talented quilter and we had always said when I retired we would spend 2 weeks together so I could learn some of her methods. She passed away in 2010, 6 months before I retired. I was left one of her sewing machines and some of her books and patterns and tools of the trade. I will learn someday I'm sure! I truly enjoy your blog, inspiration to keep trying new things and work on perfecting my knitting most of all! New yarn = yay! old yarn, also yay! Plying: the most fun part of spinning? New Year's Day, all over again!